For general enquiries please see our contact page. 2018-2023 Lead UK PI on NSF-NERC International Thwaites Glacier Collaboration grant: “Geological history constraints on the magnitude of grounding line retreat in the Thwaites Glacier system”, with Brent Goehring (Tulane), Dylan Rood (Imperial), John Woodward (Northumbria), Greg Balco (Berkeley Geochronology Center), Brenda Hall (Maine) and Seth Campbell (Maine). 2015-2020 PI on NERC standard grant NE/K012088/1: “Reconstructing millennial-scale ice sheet change in the western Amundsen Sea Embayment, Antarctica, using high-precision exposure dating”, with Steve Roberts (BAS), Dylan Rood (Imperial), and Joerg Schaefer (LDEO). Johnson Mesa 63 49’40”S, 57 55’22”W Large mesa north of Abernethy Flats, between Crame Col and Bibby Point, Ulu Peninsula, James Ross Island. It was named after Dr Joanne S Johnson (b.1977), BAS geochemist. Her work led to a completely new proxy for recognising past ice sheets using alteration mineral chemistry. From 2018-2023 I am UK lead Principal Investigator on the GHC project, which is part of the International Thwaites Glacier Collaboration funded by NERC and NSF. “GHC” is short for “Geological History Constraints on the Magnitude of Grounding Line Retreat in the Thwaites Glacier System“. My co-PIs are Brent Goehring (US lead PI; Tulane University, USA), Dylan Rood (Imperial College London), John Woodward (Northumbria University), Greg Balco (Berkeley Geochronology Center, USA), and Brenda Hall and Seth Campbell (both University of Maine, USA. To listen to an interview with me and Ted Scambos about the programme for BBC Inside Science, click here. My Co-Investigators are Steve Roberts (BAS) and Dylan Rood (Imperial). The project also involves Joerg Schaefer (Lamont Doherty Earth Observatory, Columbia University), David Pollard (Pennsylvania State University), and Pippa Whitehouse (Durham) as Project Partners, and the Scottish Universities Environmental Research Centre. Steve Roberts and I undertook fieldwork around Mt Murphy in November 2015-January 2016. From 2009-2013, I my work focused on samples from the Hudson Mountains, which lie adjacent to Pine Island Glacier. This built on research of the QWAD project (see below). We obtained a high-resolution record of thinning of a tributary of Pine Island Glacier, which showed rapid thinning in the early Holocene (8 kyrs ago). This research was published in 2014 in Science (see Johnson et al., 2014). From August 2002 to April 2005, I worked on a project focusing on the origin and palaeoenvironmental implications of authigenic alteration minerals in volcaniclastic rocks from James Ross Island (Northern Antarctic Peninsula). The aim was to understand the relationship of alteration to the composition of porewaters present during eruption, and to determine whether the chemical composition of alteration products (such as zeolites and clay minerals) reflects the alteration environment. 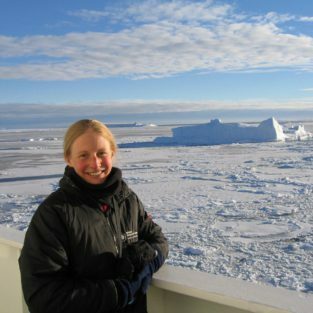 I undertook Antarctic fieldwork on James Ross Island in January 2003 and January-March 2004. This formed part of the LCHAIS (Late Cenozoic History of the Antarctic Ice Sheet) project, within the GIANTS (Global Interactions of the ANTarctic Ice Sheet) programme (which ran from 2000-2005). For my PhD, I studied the geochemistry of a suite of alkaline lavas from the Vitim Volcanic Field in Siberia. This lies ~ 200 km east of Lake Baikal, in one of the world’s major continental rift zones. My research involved using geochemical characteristics of these lavas to constrain the composition and thickness of the lithosphere in the Baikal Rift Zone, and to improve our understanding of the melting regime beneath the region during the Cenozoic. NICHOLS, K.A., GOEHRING, B.M., BALCO, G., JOHNSON, J.S., HEIN, A.S., TODD, C. (2019) New Last Glacial Maximum ice thickness constraints for the Weddell Sea sector, Antarctica. The Cryosphere, submitted. JOHNSON, J.S., NICHOLS, K.A., GOEHRING, B.M., BALCO, G., SCHAEFER, J.M. (in review, 2019) Abrupt mid-Holocene ice loss in the western Weddell Sea Embayment of Antarctica. Earth & Planetary Science Letters. JOHNSON, J.S., O’DONNELL, J.P., THOMAS, E.R. (2018) In situ measurements of snow accumulation in the Amundsen Sea Embayment during 2016. Antarctic Science, doi: 10.1017/S0954102018000068. RAISED Consortium (2014) A community-based geological reconstruction of Antarctic Ice Sheet deglaciation since the Last Glacial Maximum. Quaternary Science Reviews 100, 1-9, doi: 10.1016/j.quascirev.2014.06.025. O’COFAIGH, C., DAVIES, B. J., LIVINGSTONE, S. J., JOHNSON, J.S., SMITH, J. A., HOCKING, E., HODGSON, D. A., ANDERSON, J. B., BENTLEY, M. J., CANALS, M., DOMACK, E., DOWDESWELL, J. A., EVANS, J., GLASSER, N. F., HILLENBRAND, C.-D., LARTER, R. D., ROBERTS, S. J. (2014) Reconstruction of ice-sheet changes in the Antarctic Peninsula since the Last Glacial Maximum. Quaternary Science Reviews 100, 87-110, doi: 10.1016/j.quascirev.2014.06.023. LINDOW, J., CASTEX, M., WITTMANN, H., JOHNSON, J. S., LISKER, F., GOHL, K., SPIEGEL, C. (2014) Deglaciation in the Amundsen Sea Embayment, West Antarctica – a new piece in the jigsaw, Quaternary Science Reviews 98, 166-173, doi: 10.1016/j.quascirev.2014.05.010. LARTER, R. D., ANDERSON, J. B., GRAHAM, A. G. C., GOHL, K., HILLENBRAND, C. D., JAKOBSSON, M., JOHNSON, J. S., KIRSHNER, A. E., KUHN, G., NITSCHE, F. O., SMITH, J. A., BENTLEY, M. J., DOWDESWELL, J. A., EHRMANN, W., KLAGES, J. P., LINDOW, J., O COFAIGH, C., SPIEGEL, C. (2014) Reconstruction of changes in the Amundsen Sea and Bellingshausen Sea sector of the West Antarctic Ice Sheet since the Last Glacial Maximum. Quaternary Science Reviews 100, Special Issue on Antarctic Ice Sheet History, 55-86, doi: 10.1016/j.quascirev.2013.10.016. SMELLIE, J. L., JOHNSON, J. S., NELSON, A. E. (2013) Geological map of James Ross Island. I. James Ross Island Volcanic Group (1:125 000 scale). British Antarctic Survey GEOMAP 2 Series, Sheet 5, British Antarctic Survey, Cambridge, UK. JOHNSON, J. S., , EVEREST, J. D., LEAT, P. T., GOLLEDGE, N. R., ROOD, D. H., STUART, F. M. (2011) The deglacial history of NW Alexander Island, Antarctica, from surface exposure dating. Quaternary Research 77, 273-280. doi: 10.1016/j.yqres.2011.11.012. JOHNSON, J. S., BENTLEY, M. J., ROBERTS, S. J., BINNIE, S., FREEMAN, S. P. H. T. (2011). Holocene deglacial history of the north east Antarctic Peninsula – a review and new chronological constraints. Quaternary Science Reviews 30, 3791-3802. doi: 10.1016/j.quascirev.2011.10.011. BENTLEY, M. J., JOHNSON, J. S., HODGSON, D. A., DUNAI, T. J., FREEMAN, S., O’COFAIGH, C. (2011). Rapid deglaciation of Marguerite Bay, western Antarctic Peninsula, in the early Holocene. Quaternary Science Reviews 30, 3338-3349, doi: 10.1016/j.quascirev.2011.09.002. GOLLEDGE, N. R., EVEREST, J. D., BRADWELL, T., JOHNSON, J. S. (2010) Lichenometry on Adelaide Island, Antarctic Peninsula: size-frequency studies, growth rates and snowpatches. Geografiska Annaler 92A (1), 111-124. JOHNSON, J. S., SMELLIE, J. L., NELSON, A. E., STUART, F. M. (2009). History of the Antarctic Peninsula ice sheet since the early Pliocene – evidence from cosmogenic dating of Pliocene lavas on James Ross Island, Antarctica. Global and Planetary Change 69, 205-213, doi: 10.1016/j.glopacha.2009.09.001. HODGSON, D. A., ROBERTS, S. J., BENTLEY, M. J., SMITH, J. A., JOHNSON, J. S., VERLEYEN, E., VYVERMAN, W., HODSON, A. J., LENG, M. J.,CZIFERSKY, A., FOX, A. J., SANDERSON, D. C. W., SUGDEN, D. E. (2009). Exploring former subglacial Hodgson Lake, Antarctica. Paper I: site description, geomorphology and limnology. Quaternary Science Reviews 28, 2295-2309, doi: 10.1016/j.quascirev.2009.04.011. JOHNSON, J. S., HILLENBRAND, C.-D., SMELLIE, J. L., ROCCHI, S. (2008) The last deglaciation of Cape Adare, northern Victoria Land, Antarctica. Antarctic Science 20 (6), 581-587, doi: 10.1017/S0954102008001417. HAMBREY, M. J., SMELLIE, J. L., NELSON, A. E., JOHNSON, J. S. (2008) Late Cenozoic glacier-volcano interaction on James Ross Island and adjacent areas, James Ross Island. Geological Society of America Bulletin 120 (5/6), 709-731, doi: 10.1130/B26242.1. SMELLIE, J. L., JOHNSON, J. S., MCINTOSH, W. C., ESSER, R., GUDMUNDSSON, M. T., HAMBREY, M. J., VAN WYK DE VRIES, B. (2008) Six million years of glacial history recorded in volcanic lithofacies of the James Ross Island Volcanic Group, Antarctic Peninsula. Palaeogeography, Palaeoclimatology, Palaeoecology 260, 122-148, doi: 10.1016/j.palaeo.2007.08.011. JOHNSON, J. S., BENTLEY, M. J., GOHL, K. (2008) First exposure ages from the Amundsen Sea Embayment, West Antarctica: the Late Quaternary context for recent thinning of Pine Island, Smith and Pope Glaciers. Geology 36 (3), 223-226. LARTER, R. D., GOHL, K., HILLENBRAND, C. -D., KUHN, G., DEEN, T. J., DIETRICH, R., EAGLES, G., JOHNSON, J. S., LIVERMORE, R. A., NITSCHE, F. O., PUDSEY, C. J., SCHENKE, H. -W., SMITH, J. A., UDINTSEV, G., UENZELMANN-NEBEN, G. (2007) West Antarctic Ice Sheet Change Since the Last Glacial Period. EOS, Transactions, American Geophysical Union 88 (17), 189-190. JOHNSON, J. S.& SMELLIE, J. L. (2007) Zeolites as proxies for eruptive paleoenvironment. Geochemistry, Geophysics, Geosystems 8, Q03009, doi: 10.1029/2006GC001450. WILLIAMS, M., SMELLIE, J. L., JOHNSON, J. S., BLAKE, D. B. (2006) Late Miocene asterozoans (Echinodermata) in the James Ross Island Volcanic Group. Antarctic Science 18 (1), 117-122. JOHNSON, J. S. (2004) Ancient Antarctica. Planet Earth (NERC) Spring 2004, 32. SMELLIE, J., ROCCHI, J., JOHNSON, J., DI VICENZO, G., SCHAEFER, J. (2019) Construction and environmental implications of a tuff cone erupted under cold-based ice: Harrow Peaks, northern Victoria Land, Antarctica. EGU General Assembly 2019, Vienna, 7-12 April 2019. BUSCH, P., SCHEINERT, M., KNÖFEL, C., EBERLEIN, JOHNSON, J., HORWATH, M., SCHROEDER, L., GROH, A. (2017) GNSS measurements in West Antarctica to reconcile glacial-isostatic adjustment. International Workshop on Glacial Isostatic Adjustment and Elastic Deformation, Reykjavik, Iceland, September 2017. JOHNSON, J.S., ROBERTS, S.J., IRELAND, L., ROOD, D.H., SCHAEFER, J.M., WHITEHOUSE, P.L., POLLARD, D. (2016) Glacial-geomorphological evidence for past ice cover in the western Amundsen Sea Embayment of Antarctica. AGU Fall Meeting, San Francisco, December 2016. SMELLIE, J. L., JOHNSON, J. S., NELSON, A. E. (2013) New 1:125 000-scale geological map of the James Ross Island Volcanic Group, the most important terrestrial repository of Neogene palaeoenvironmental information in the Antarctic Peninsula—Scotia Sea region. The Scotia Arc: Geodynamic Evolution and Global Implications, Granada, May 2013. LINDOW, J., CASTEX, M., KAMP, P., JOHNSON, J.S. , WITTMANN, H., LISKER, F., GOHL, K., SPIEGEL, C. (2012) The exhumation history of eastern Marie Byrd Land, West Antarctica –tectonic evolution and glacial dynamics. Thermo 2012, Guilin, China, 24-28th August 2012. JOHNSON, J. S., BENTLEY, M. J., SCHAEFER, J. M., FOGWILL, C. J., SMITH, J. A., SCHIMMELPFENNIG, I., GOHL, K. (2011) Rapid early- to mid-Holocene thinning of Pine Island Glacier detected cosmogenic exposure dating. West Antarctic Ice Sheet workshop, Loveland, Colorado, 21st-23rd September 2011. JOHNSON, J. S., , EVEREST, J. D., LEAT, P. T., GOLLEDGE, N. R., ROOD, D. H., STUART, F. M. (2011) The deglacial history of NW Alexander Island, Antarctica, from surface exposure dating. International Symposium of Antarctic Earth Sciences, Edinburgh, UK, 10-16th July 2011. JOHNSON, J. S. , SCHAEFER, J. M., SCHIMMELPFENNIG, I., SMITH, J. A., BENTLEY, M. J., FOGWILL, C. J., GOHL, K. (2011) Pine Island Glacier had thinned close to present limits by the mid-Holocene. International Symposium of Antarctic Earth Sciences, Edinburgh, UK, 10-16th July 2011. LINDOW, J., SPIEGEL, C., JOHNSON, J. S., CASTEX, M., LISKER, F., GOHL, K. (2011) Glacial retreat since the Last Glacial Maximum – new constraints from the Walgreen Coast, west Antarctica. International Symposium of Antarctic Earth Sciences, Edinburgh, UK, 10th-16th July 2011. JOHNSON, J. S., BENTLEY, M. J., ROBERTS, S. J., BINNIE, S. A., FREEMAN, S.P.H.T. (2010) Holocene deglacial history of the north east Antarctic Peninsula. 6th Antarctic Peninsula Climate Change meeting, Leeds, UK, 22nd-23rd July 2010. BENTLEY, M. J., JOHNSON, J. S., LARTER, R. D., FOGWILL, C. J. (2009) What do we know about the West Antarctic Ice Sheet at the Last Glacial Maximum, and its deglacial history? Antarctic Climate Evolution symposium, Grenada, Spain, 7th-11th September 2009. LARTER, R. D., GRAHAM, A. G. C., HILLENBRAND, C.-D., JOHNSON, J. S., SMITH, J. S., BENTLEY, M. J. (2009) Things we don’t know about the West Antarctic Ice Sheet at the Last Glacial Maximum. Antarctic Climate Evolution symposium, Grenada, Spain, 7th-11th September 2009. SMELLIE, J. L., HAYWOOD, A., HILLENBRAND, C.-D., JOHNSON, J. S., NELSON, A. E., HAMBREY, M. J., LUNT, D., VALDES, P. (2009) Seven million year history of the Antarctic Peninsula ice sheet revealed by coupled geological and climate modelling studies. Antarctic Climate Evolution symposium, Grenada, Spain, 7th-11th September 2009. JOHNSON, J. S., BENTLEY, M. J., GOHL, K. (2008) First exposure ages from the Amundsen Sea Embayment, West Antarctica: The Late Quaternary context for recent thinning of Pine Island, Smith and Pope Glaciers. EGU, Vienna, 14th-18th April 2008. SMELLIE, J. L., NELSON, A. E., JOHNSON, J. S., MCINTOSH, W. C., ESSER, R., GUDMUNDSSON, M. T., HAMBREY, M. J., VAN WYK DE VRIES, B. (2007) Six million years of environmental (glacial-interglacial) conditions preserved in volcanic lithofacies of the James Ross Island Volcanic Group, northern Antarctic Peninsula. ISAES, Santa Barbara, USA, August 2007. JOHNSON, J. S., BENTLEY, M. J., GOHL, K. (2007) Deglaciation of the West Antarctic Ice Sheet: surface exposure dating in the Amundsen Sea region. INQUA, Cairns, Australia, 28th July-3rd August 2007. JOHNSON, J. S., GOHL, K., O’DONOVAN, T. L., BENTLEY, M. J. (2006) Surface exposure dating using cosmogenic isotopes: a field campaign in Marie Byrd Land and the Hudson Mountains. West Antarctic Ice Sheet meeting, Pack Forest, Eatonville, USA, September 2006. JOHNSON, J. S. & SMELLIE, J. L. (2004) Determining Eruptive Palaeoenvironment: a Study of Alteration Minerals from the James Ross Island Volcanic Group, Antarctica. IAVCEI meeting, Pucon, Chile, November 2004. GARNER, J. S., GIBSON, S. A., THOMPSON, R. N., NOWELL, G. M. (2001) Contribution of pyroxenite-derived melts to Baikal rift-related magmatism. EOS 82(47), F1396. GARNER, J. S., GIBSON, S. A., THOMPSON, R. N. (2001) Lithospheric thinning associated with the Baikal Rift, Siberia: geochemical evidence from the Vitim volcanic field. Abstract volume, Volcanic & Magmatic Studies Group 2001. Smellie, J.L., Johnson, J.S., Nelson, A.E.. (2013) Geological map of James Ross Island. I. James Ross Island volcanic group. British Antarctic Survey GEOMAP 2. Cambridge, British Antarctic Survey. Graham, Alastair G.C., Larter, Robert D., Gohl, K., Hillenbrand, Claus-Dieter, Smith, James A., Johnson, Joanne S., Kuhn, G.. (2007) Late Quaternary ice sheet dynamics and deglaciation history of the West Antarctic Ice Sheet in the Amundsen Sea Embayment: preliminary results from recent research cruises. In: Antarctica: a keystone in a changing world. Online proceedings of the 10th International Symposium on Antarctic Earth Sciences, Santa Barbara, California, August 26 - September 1, 2007, National Academy Press, 4 pp. (U.S. Geological Survey Open-File Report, ). Smellie, J.L., Nelson, A.E., Johnson, J.S., McIntosh, W.C., Esser, R., Gudmundsson, M.T., Hambrey, M.J., van Wyk de Vries, B.. (2007) Six million years of environmental (glacial – interglacial) conditions preserved in volcanic lithofacies of the James Ross Island Volcanic Group, northern Antarctic Peninsula. In: Antarctica: a keystone in a changing world. Online proceedings of the 10th International Symposium on Antarctic Earth Sciences, Santa Barbara, California, August 26 - September 1, 2007, National Academy Press, 4 pp. (U.S. Geological Survey Open-File Report, ). Johnson, Joanne. (2004) Ancient Antarctica. Planet Earth, Spring. 32-32.